In this post I'll try to shed some light on what Chad Hower covered in his edc2008 session :"VS2008 New Enhancements". We just saved some keystrokes :). Using Language Integrated Query with collections can make many of programming tasks easier, like searching for an object or objects in a collection that meet a certain criteria. Some people may think that the 'var' keyword is what indicates a LINQ expression, but no, it's actually the 'from'. A good place to think about using LINQ is where you usually use for and foreach. I'll talk about Anonymous types usage in LINQ, although there are other cases when are useful. In the above LINQ example, what if we don't need to get the result as a collection of complete objects of the original collection, and we just need one or two attributes (just as we can select just a few columns from a SQL database, not all columns from the table). 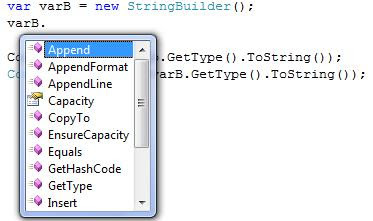 Here, we created a new type on the fly, it has 2 properties: value which is a string and length which is an integer. Chad talked about other thinks like OBA (Office Business Applications), WPF. The most important thing is that WPF works fine with Winforms. Winforms can host WPF components. A very interesting presentation that Chad has shown for us was the History of Microsoft Office Download it and enjoy !! Besides being funny, it shows how MS Office navigation had to evolve. Chad just scratched the surface, but left us hungry for more knowledge about the existing new features.